1 March is when spring starts on the meteorological calendar; however, vicious winter cold will continue to be recorded until the weekend. The strong east wind, which in the Netherlands got the nickname "Russian Bear" and is known in the UK as "Beast from the East", has caused temperatures to drop well below the freezing point in many parts of Europe. Rome got a blanket of snow, and in Croatia the layer of snow was 1.80 metres thick. On the slopes in the Alps it was freezing, and the same cold has been measured in many parts of northern Europe. Does this winter weather affect the fruit and vegetable market? The cold and snow have disrupted life in several European countries. In the Netherlands, code yellow was issued because of cold and local snow storms. In the United Kingdom, a weather alarm was issued, and Ireland temporarily issued a code red. The main consequences for the market are delays in the supply, consumers staying home and a rising demand for winter vegetables. The consequences in other parts of Europe may be greater. Further to the south and east, the first fruit trees were already in bloom or the flowers were about to sprout. 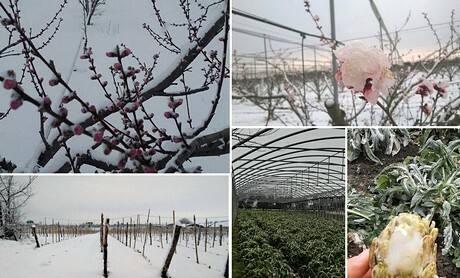 The freezing cold may very well damage the early stone fruit harvest in these regions. In few other places did the mercury drop as low as in Poland, but trade remains calm. A day temperature of -10 degrees Celsius is perceived as historically very normal, according to a trader. In Bologna, in the night of 27 February 2018, the mercury dropped to -7.5 °C. How much damage the frost will cause to the crops is still unclear, but the severe cold even posed a threat to the lettuce grown in greenhouses. A radicchio grower says that "the harvest is almost finished. We only have a bit left to harvest in the Marche region, where part of the production may have been lost, but we'll only know that when the cold spell is over." In Savona, Piana or Albenga, the freezing temperatures recorded have had dramatic consequences for the artichokes. The harvest has been lost. In Emilia-Romagna, some of the early stone fruit trees were in bloom when the frost hit the area. The harvest was "burned" by it. In other regions, growers tried to avoid its impact on the orchards with torches. In Ravenna and Trentino, the torches were lit to protect the blossom. There are also concerns about the plums and cherries in Vignola, Modena. Even if the buds are closed, the 13 degree frost could cause damage. In the south of Italy, growers are also concerned about the frost. In some places, temperatures have fallen as low as -4 °C. The early stone fruit, but also the vegetable harvest, which was about to start, are threatened. According to reports, there may be serious consequences for the production of peas, broad beans, potatoes, melons, lettuce or fennel, among others. 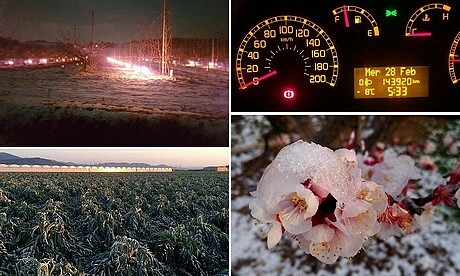 In parts of Puglia, temperatures fell for several hours during the night from 26 to 27 February to 4 to 6 degrees below zero. This damaged the stone fruit blossom, causing a part to be lost. 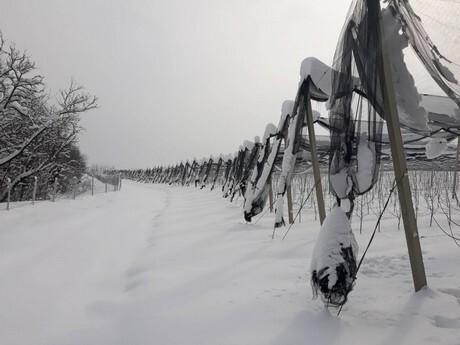 On the fields in Foggia, vegetables were damaged by frost, and in Brindisi, Francavilla, Latiano, Fasano and Ostuni a lot of snow fell. The extent of the damage is still unclear, although the flowers in almond, nectarine and apricot trees were visibly affected the next morning (28 February). The real extent of the damage will only become clear once the temperature rises. In the north of Naples and the adjacent Caserta, in the Campania region, the situation is no different. The damage is visible, especially in the orchards and greenhouses. There are concerns about the trees that were already in bloom (peaches, apricots, plums and cherries), the vegetables that were about to be harvested (peas, broad beans, potatoes, melons, lettuce and fennel) and the strawberry harvest. Moreover, there are logistical problems, because trucks are unable to pick up the products. Even the coastal Amalfi Coast region is covered with snow. Lemons are most prone to frost damage; therefore, there could be an impact on the harvest of the "yellow gold" and the PGI Sfusato amalfitano in this region. In Val di Cornia, Tuscany, the frost damaged around 700 hectares of artichokes. This means that almost the entire production has been lost. On 28 February, it was -8 °C. There are concerns about the production that is planned to be harvested in April/May. Rain is expected in the coming days, which is necessary to see how the plants react. In Marche, the mercury dropped to -17 degrees. The frost may have damaged the harvest of products like fennel, cauliflower, radicchio, escarole, cabbage, artichoke and fruit. In the Jesino region, the harvest of early artichokes is threatened. The first reports of damage to vegetables in the province of Macerata (Morrovalle region) have also been issued. In southern France, the temperature today stands at 7 degrees Celsius. A grower from the south devoted to the cultivation of a wide range of fruits is currently only actively involved with apples. For this crop, the cold has so far had no negative consequences. In Nord Pas de Calais, it is currently about 4 degrees below zero. Here the cold has had a huge impact. A grower from the north summarises briefly: "We will soon be unable to harvest any fruit." Apple growers are not yet very concerned about the new season. The cold, with -10 degrees during the day and -20 degrees at night, is historically normal for the country, according to a grower. In recent years, it has been exceptionally warm in the first months of the year. If the cold persists, it could have consequences for the health of the trees for certain breeds. "But we are not yet close to that stage and the temperature is expected to rise in the coming weekend." As far as vegetables are concerned, there has been an increase in the demand for winter vegetables. The cold will not have a big impact on the crops, but daily routines are partially disturbed. Greenhouse growers of, for example, cabbage and lettuce are working hard these days to keep the temperature inside the greenhouses above the freezing point. Last night (28 February to 1 March) was one of the most difficult for Hungarians. The temperature oscillated between -10 and -24.6 °C. For apples, cherries and prunes, the cold will not have any major consequences, because the trees are not yet in bloom. This is not the case for the apricots in Western Hungary. The apricot trees there were in an early stage of flowering, and after an initial inspection, a loss of up to 70% of the production is expected for certain varieties. Losses are also expected for some peach varieties in the south east of the country, even though the bloom was not in as advanced a stage as apricots. The actual extent of the damages will only become clear over time. It is also impossible at this time to be sure about how the season will go. "Even if there is 80% loss, it could still be a good season; it all depends on the weather that is yet to come," said a trader. In the winter months, there is no open ground cultivation. Most vegetables are currently harvested in greenhouses. Most large producers have heating in their greenhouses. For those who don't, the cold will cause some damages. In the coming days, it will get warmer and next week the temperature is expected to reach 10 degrees Celsius, which is normal for this period. In the icy cold Croatia, with night temperatures of -20 degrees and day temperatures of -14 degrees, the more than 20 cm of snow that fell early in the week was welcome. The snow forms a natural insulation layer around the trees. The low temperature is a greater threat. Cherries, apricots and peaches are at greatest risk, as many trees were on the verge of sprouting. The damage will only become visible when the blossom comes out. 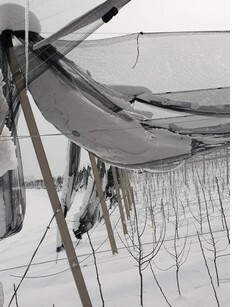 The cold could have a positive impact on apple crops. The kiwi harvest is not threatened by the cold, as the trees' flowers are not yet sprouting. Furthermore, the temperature is not too bad, and although there was some snow on Monday, it had already melted before the end of the day. In the coming days, the mercury will rise to around 10 °C, which is not uncommon for this time of the year. Citrus crops have also escaped the danger. Although the season is still underway, the snow did not reach the citrus regions. A crop that is at risk is sweetcorn. It has recently been sown and the snow in the north and the rain in Preveza pose a threat. Growers await warmer weather in the coming days, after which, according to a grower, at least five sunny days are needed in order to have a successful harvest. After a severe frost, the supply of vegetables in the west of the country has been delayed. As a result, prices on wholesale markets have increased. Potatoes became 40% more expensive in a few days, with the price reaching 0.15 Euro per kilo, local media reports. Cabbage also became more expensive (+22%), reaching 0.15 to 0.18 Euro per kilo. Carrots became 18% more expensive (0.15-0.24 Euro/kg) and onion prices rose by 13% (0.12-0.15 Euro/kg). Beets recorded the smallest price increase, with an 8% rise, which resulted in a price of 0.15 to 0.27 Euro per kilo. The sharp east wind and plentiful snow in some parts of the country have marked the weather of the past few days. The transition to meteorological spring coincided with an official minimum temperature of -8.5 degrees. This was officially the coldest night of the winter. The thickness of natural ice has been tested and some have put their skates on. The eating habits of the Dutch are also influenced by the cold. The demand for winter vegetables is rising. Kale and sauerkraut, for example, are highly demanded. The demand for citrus also traditionally increases when the mercury drops. According to a trader, however, this is still insufficient to offset the lower sales due to the cold. Market traders stay at home, just like a part of the consumers. Some of the traders do put up their market stalls up. Thanks to heaters, the temperature remains above the freezing point. A greengrocer from Limburg says that asparagus are also doing well. The cold doesn't have an impact on the demand for this typical spring vegetable. As in other parts of the United Kingdom, a lot of snow has fallen in Scotland. As a result, hundreds of motorists were stranded on the motorway on Wednesday night. According to reports, some of them were stuck in vehicals for up to 13 hours. The weather in the north of the country is influenced by the same easterly wind that has caused the mercury to drop in other parts of Europe. The effect is the same: snow and severe frost, with a weather alarm as a result. Further south, in Lincolnshire, even snowploughs had trouble clearing the roads. The A52 was described as "impassable." Traffic was also disrupted in the south and west of the country. A large trading company in Edinburgh remains open, but decided not to deliver orders because of the bad weather. Workers in the night shift and some of those in the day shift were also allowed to stay at home. The company expects things to normalise a bit by noon, so deliveries may be resumed from tomorrow. A truck owned by this company was stranded in the blizzard. Daily assessments are made on the development of the situation. Additional staff is ready to make additional deliveries in the weekend. In the Irish capital Dublin, the temperature fell to -7 degrees Celsius yesterday and there was also snow. At 7 o'clock on Wednesday morning, code orange was issued; five minutes later, it was raised to code red. "We are selling more salt than fruit and vegetables at the moment. I have just issued a message to report that no deliveries will be made on Thursday and Friday." On Thursday morning a warning issued to the East coast tostay indoors from 11am until 3pm Friday has been extended to the restof the country. The schools are closed as are shops, offices and wholesalemarkets, infact the whole country is on shut down. Airports are alsoclosed. They areforecasting 40 cm of snow will fall and 5 meter high snow drifts are possiblein places. The cold comes from Siberia, but is mixed with a storm that formed above the Bay of Biscay. This has resulted in snow and ice in Ireland. The consequences are now visible in the supermarkets. Shelves are empty as the Irish have gone on a stocking up spree.